It seems to be a hotbed of controversy: exactly where the splendid idea of eating cinnamon rolls with chili began. I’ve always believed that eating chili with cinnamon rolls was a Nebraska thing. I’ve assumed that it was our good Mennonite neighbors here in the Midwest who started this strangely self-indulgent combination. It was something my mom said that led me to believe this, as it seems that all her Mennonite friends automatically bake cinnamon rolls when they are having chili. My mom is not often wrong, either. Also, the community soup suppers hereabouts always include cinnamon rolls, if chili is to be served. I heartily endorse this tradition. The Runza restaurants in Nebraska, as well, serve cinnamon rolls with their chili. But now as I peruse the internet, I see that unwitting folks in Kansas are claiming ownership for this amazing combination. Not to mention some well-meaning (but probably sweetly mistaken) types in Iowa. And some deluded individual (get this) in the state of New York is actually claiming that this is the way folks eat their chili in their area, too. A girl blogger in Washington state–obviously good at making things up, as well, writes that she ate this combination all the time, when she was growing up, but then she grew up in Iowa. That just shows you one thing. We here in Nebraska are the only folks around who don’t lie through our teeth, specifically about meal combinations. Hey, I have a splendid idea, albeit borne out of feelings of regional superiority, admittedly. To wit: Let’s end this controversy this very day, dear Gentle Reader, right here in our little corner of the interweb. Tell me this, if you will: at your house, when you cook up a big batch of chili, do you automatically make cinnamon roll dough, too? Do you smack your lips, as a general rule, whenever you smell chili simmering, knowing that you’re also going to get to indulge in a bit of basically-dessertish-sugar-and-frosting-encrusted cinnamon roll goodness with your nourishing soup? I think that’s the real issue here: Can we get away with eating dessert with our meal? That is it. Better yet, can we fulfill our childish fantasies of eating the dessert first? At our house, we make these lovely honey-cinnamon rolls with my favorite bucket dough, and I published the recipe right here. Cinnamon rolls with chili: getting away with eating dessert WITH our meal. 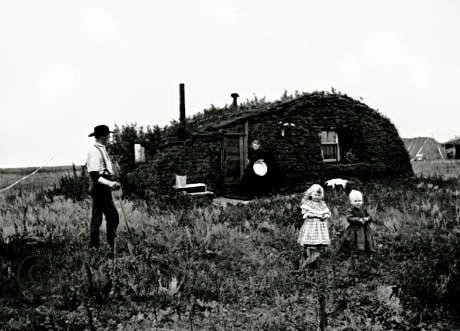 I see it now: probably this is what happened: A Nebraska homesteading farm wife, lonely and workworn (you can picture her, right–cough), a hundred years ago or so, pulled ingredients out of her larder to make a big pot of chili soup. She had had a busy and punishing week, er, month, er, season, er few years, what with the locusts eating the crops that one year, and the Indians stopping by to scare her silly from time to time, existing on corn and only corn for months at a time, and then–the Mister getting lost in that blizzard and losing a few fingers and the–well, you get the idea. As her chili simmered, she pulled out a crock of dough and started to form rolls to go with the soup. She reached for the butter–oops!–she dumped the sugar crock all over the mound of dough. She started to try to clean up the precious sugar, and in the process (she was a bit rattled) she upset the precious little jar of cinnamon that her good man had brought home from the trading post, after he had gone to trade their extra corn for a few precious non-essentials. (See the housewife back there next to the house, clutching her wash tub? That was as far from the kitchen as she dared go, bless her, even on the day that the photographer came by.) Photo credit Wikipedia. Alas! The dough was ruined–or was it? In typical prairie woman style, the tired woman decided to make lemonade out of lemons: she rolled up the dough, cinnamon, sugar, and all, and sliced it into rounds, chucking the slices wearily into a pan, dotted it with butter (what the heck! ), let it rise, and baked it. She didn’t dare waste the dough, after all. Probably it wouldn’t be edible–but . . . you never knew . . .
Life for this woman was never the same again. The combination of chili and cinnamon rolls was so delicious and different and heady and pleasing, that her husband raved to whomever would stand still long enough to hear him. This bold cooking move set her apart in her community, and she won acclaim no matter where she went from that day forward. She was given the key to the village, and from that day forward, she rode in the front of the 4th of July parade, in the most honored and cherished position. She was univerally lauded. Respectful applause was directed toward her. She flourished in all ways--socially, economically, and emotionally, and her husband built her a big house with more than one chest freezer (as soon a electricity was a thing), and encouraged her to raise a couple of homestead hogs, as she had long been dreaming of. 🙂 She could do no wrong, and it was all due–as so many blessings are–to that one little “oops,” and being able to turn it around to something grand. It happened, undoubtedly here on the plains of Nebraska, in the early days. Now it’s time for our little survey, and then we’ll move on to the recipes. First: what state do you live in? If you’re not in the U.S., which country do you live in? Secondly: Do you eat chili, and if you do, do you eat it (whenever possible) with cinnamon rolls? 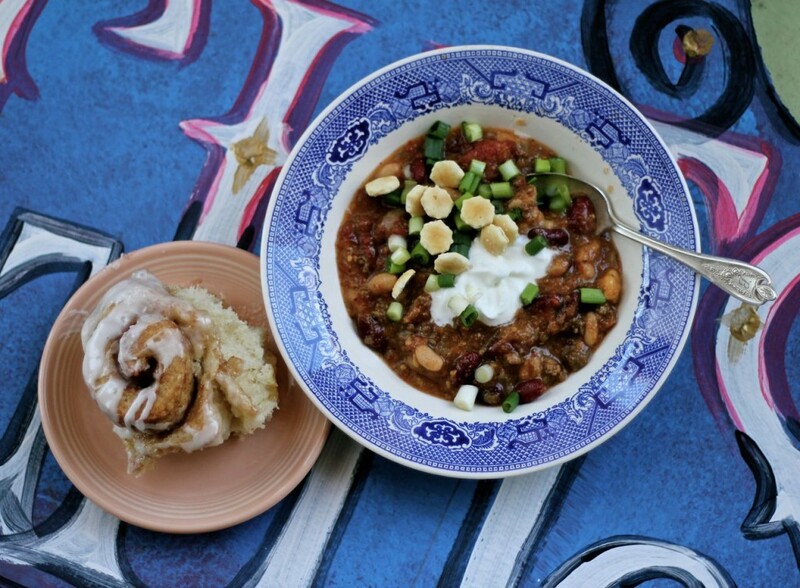 It’s the Great Chili Question: do you eat your chili with cinnamon rolls? Oooh, I am rubbing my hands together in anticipation, as I can’t wait to hear what you all have to say. We will prevail with The Last Word. IF you are of a mind to, I’d love it if you’d share this post (it’s how you can say thank you to me, you know, if you wanna) with your friends and relations, so they can chime in, too. Okay. Now to the recipe. From the time it gets cool in the fall, chili is one of our favorite meals to make and eat at our place. Basically it is an easy “dump” recipe: mostly you are dumping ingredients into the crock pot, and then giving them all some time to cook together. There’s a bit more to it, but that’s basically it. Since we are in “high melodrama” season, with lots of set-painting and designing and music-practicing and lines-memorizing, “dump” recipes are about the only ones that get prepared around here. So. Oh, and “second-day chili,” according to my kids, is always superior to first-day chili. So there you have it. 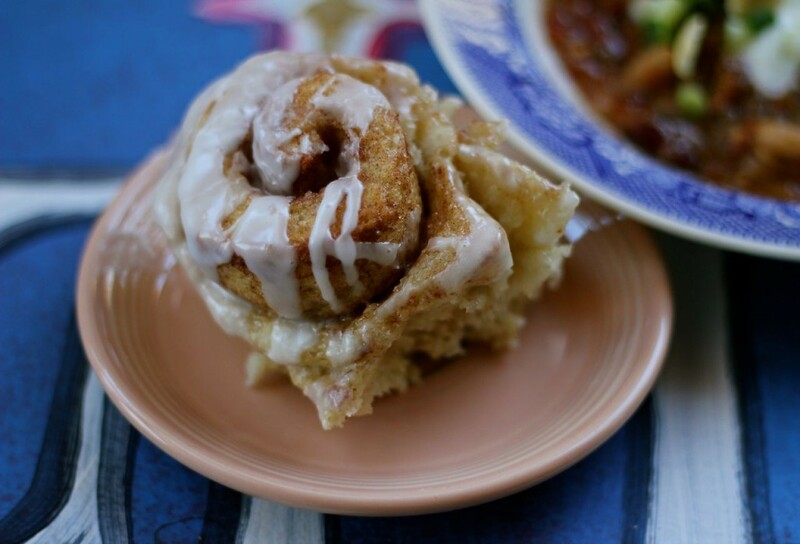 Chili with cinnamon rolls: kick it up a notch with a great spice blend! What could be tastier or more comforting than a big steaming bowl of chili for supper on a cold night? Nothing, that's what: and if it is accompanied by some fresh cinnamon rolls, all the better! First, saute onion and garlic in olive oil until soft and aromatic. Add hamburger and brown. Drain fat, if necessary. Drain cans of beans and add to the skillet and stir until hot. Dump tomatoes, water, Worcestershire sauce and hamburger-bean mixture into a large crock pot. Cook on low for 6 to 8 hours, or 3 to 4 hours on high. minutes before serving, taste and adjust seasonings, and stir in corn meal. Serve with an assortment of the following (optional): sour cream, shredded cheese, sliced jalapeno peppers, sliced green onions, crackers or corn chips, and so on. Two things set this chili apart: my spice mixture, and the clever addition of a bit of cornmeal in the last half-hour. Try it. You’ll see. And you’ll love to mix up a big batch of this spice mix, so it’s handy for using in chili, tacos, or any Mexican-style foods. The chili and cinnamon roll are sitting on one of the pieces from our set: a sneak peak! Remember to chime in below in the comments, on the important issues that we discussed today: The Great Chili Question: where do you live, and do you eat cinnamon rolls with your chili? Lives depend on this. Or at least, reputations of certain bloggers I know (cough). Tagged on: best homemade chili recipe, homemade chili and cinnamon rolls recipe, homemade cinnamon rolls recipe with honey, how to make a homemade chili spice blend, how to make homemade chili, should I serve cinnamon rolls with my chili? 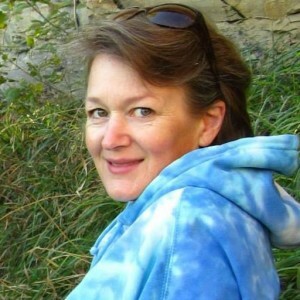 ← “2,000 Superfluous Things” Challenge, Convo with Nona, & FREE Download! I am a Nebraskan. Lived here all my life. But I do not (hangs head in shame) make cinnamon rolls with my chili. We eat fried bread. It’s how my parents and grandparents did too. Maybe you should try it soon—you may be hooked after the first time, too! Thanks for your comment! I am from Wyoming and lived here all of my life. I love chili with cinnamon rolls, although I do not take the time to make them every time I make chili. My father likes chili with cornbread, he grew up in South Dakota. My mother grew up in Wyoming and would make cinnamon rolls often when she made chili. Where in WY, Kristi? My brother lives in that lovely state, too. When I was growing up in a small Nebraska town, our fabulous school cook always made cinnamon rolls with chili, but fried bread with spaghetti. For many years, I’ve wished I had a recipe or instructions on how to make fried bread. Can you share this with me? It would make my Cornhusker heart very happy. Leah, I think if you did a Google search for flatbread, you’d find a plethora of great options! I don’t have a favorite flatbread recipe, but now I feel like making some . . ! Good luck! I’d love to hear what you come up with? Thanks for the suggestion. I have done a lot of online searching, but the fried bread we had was not flatbread. It was an irregularly shaped blob of dough that puffed up when fried. Not flat at all. It’s difficult to describe! Leah, it almost sounds like pita. Have you ever tried making that? Sounds like Indian or Navajo fried bread maybe? I’m in Utah, I love chili but I’ve never heard of eating it with cinnamon rolls but I really want to start doing so now. Well I’m from Washington State and I’ve never heard of cinnamon rolls with chili until today! Although I do put cocoa powder and coffee in my chili. We always eat ours with homesteaders cornbread. My favorite recipe. Really moist and a little sweet. The chickies love it too! I am from Washington State and for as long as I can remember we have eaten chili with cinnamon rolls. My husband grew up in California and swears by cornbread! Washington State . . . wow, that’s about as far west as I’ve heard from! Chili and cinnamon rolls. It was my favorite school lunch as a kid. I don’t always make them when we eat chili, but I always think about it. I am from Nebraska. I grew up Minnesota Mennonite with chili, saltines and homemade wheat bread. Those Nebraska Mennonites, at least the ones in Henderson are the same variety. I think the Mennonites you speak of are Swiss background rather than German. We don’t have the same food traditions. We did sometimes, but not all the time. I always assumed it was a Nebraska thing, but maybe it is just a Midwest thing. You sure made me hungry for it though! Never heard of it here in Ohio but maybe, just maybe my wife may try it. I know that she and her family like peanut butter on bread with her chili. I myself just like chili and crackers and since I have discovered that yellow tomatoes are agreeable with my digestive system, have got to have chili for the first time since 2000. Maybe I’ll even give it a try! I am from ohio. I eat peanut butter with chili. Up North, in FROZEN Michigan, we eat our Chili with cornbread or garlic bread. Never heard of Cinnamon rolls with Chili, but I have never been to Nebraska! I am raised southern enough to know that chili is served with cornbread. Hubby from Texas insists that the only way is with tortillas. The thought of cinnamon rolls and chili is a total turn off to this gal. Growing up in Oklahoma, we had cornbread and cinnamon rolls, both, with our chilli, or brown beans. I do not bake the cinnamon rolls or cornbread here in Kansas. Husband doesn’t like them. I miss them. Nothin’ like sweet and savory!!! I love chili, and I love cinnamon rolls, but definitely not together! the very thought of it churns my stomach. I have never heard of cinnamon rolls with chili. I am from California, now live in Colorado, and have lived in South Carolina, Illinois, & Nevada. My parents are from Minnesota and Ohio, so they don’t eat it there either. I guess the closest would be Cincinnati Chili which I believe has some cinnamon in it. I eat my chili with cornbread and hubby (from New York & Florida) eats his with saltines. Excellent post and very well written! I have never really given much thought about eating cinnamon rolls with chilli, but after reading your post I may just have to give it a try! Thanks for sharing! I am from Iowa and only had these 2 together in high school lunches. Both were home made and were the best on the menu. Thanks Carmen! Our lunch ladies at school served the two together, as well! I live in Ohio now but my family is from West virginia. Never heard of this before but it sounds interesting. We eat chili with crackers or cornbread. I have never heard of chili and cinnamon rolls, and it doesn’t really sound good to me. I am a life-long Californian, and I always eat chili with sourdough bread. Cinnamon rolls and a hot cup of coffee does sound really good, though. I’m from lower SW Michigan and we ate saltine crackers with our chili. I grew up on: one can tomato soup, one can water, one can dark red kidney beans, one packet chili mix, one pound hamburger and some dried onions as my grandma’s chili recipe (I added one can diced tomatoes along with real onions and garlic, as well). My DH is Texan all the way and there ARE.NO.BEANS.IN.CHILI!!! Since he’s the house chef, we eat it his way, Wick Fowler mix recipe all the way. Never heard of cinnamon rolls with chili, but he does make a mean cinnamon roll other times. oh, and I live in lower Alabama now, and still never heard of cinnamon rolls and chili here. Everyone eats cornbread round these parts. And my DH, he eats saltine crackers mixed in his bowl. You really must try it out, Jules . . although it’s hard to beat cornbread and/or saltines with chili . . . cinnamon rolls are a special kind of wonderful. Whoa: when two chili cultures collide, what happens? I think you know. West Virginia here, never heard of cinnamon rolls with chili. At our house we eat grilled cheese on homemade bread. Might have to try cinnamon rolls though-why not live a little? Exactly my point! Live a little! I live in Arkansas. I have never eaten cinnamon rolls with chili. We either use crackers or cornbread when we eat chili. I’m from Kansas City and have never heard of it. But my mother was from the south and my father was from the east coast, where chili was eaten with vinegar! With vinegar? Now that’s a new one! Grew up in Kansas. School lunches demanded cinnamon rolls with chili. Lived in Colorado for 17 years and same as KS. Moved to Nebraska and the tradition continues. Great job. Enjoyed the blog. Thanks for chiming in, Mike–Wow, CO, KS, and NE! This phenomenon does seem like a Midwestern thing. My husband and I both grew up in Kansas and we had cinnamon rolls and chili growing up for school lunches. Excellent combo! We live in South Carolina now…not sure if they have the delicious combo on the school lunch menu. I’ll have to check it out at my son’s school. Check it out, Kylie, and in the interest of food research, send me a note about it, okay? And thank you! My family grew up having cinnamon rolls with chili! It was a given. Not sure where my mom got the idea. I had always assumed it was just what happened, but now i hear it’s not. Poor folks don’t know what they’re missin. Now, to set the record straight. During the meal it was chili and crackers. The dessert was the lovely cinnamon rolls. Okay, Terry, the mamas in the group would definitely agree with your order of eating the meal: soup and crackers first, and then cinnamon rolls. This is one meal where we do serve the dessert with the soup. It’s akin in our house to watching t.v. while we eat: we very rarely do it, so when we do, we feel like we’re getting away with something special! Grew up in Kansas and had Chili with cinnamon rolls with school lunch every year of my life. I’m in my 40s now and continue this tradition. I’ve brought this delicious duo to NYC and have converted friends who love it! Way to go, Rebecca! Spread the love! Born and raised in Kansas, have always had cinnamon rolls and chili together. It blew my mind reading all the posts where people have never even heard of it, where I never gave it a second though and just figured everyone knew about the wonderful combination. It was one of the meals on the school lunch menu that all of the kids enjoyed. The smell and taste of the cinnamon and sweet warm icing combined with the spice of the chili….YUMMMMYYY!! Perfect for those cold winter days! Snowing outside now and I am cooking chicken and noodles, thinking tomorrow is calling for chili and cinnamon rolls for sure!! Yes-yes-yes!! That’s how I feel about it, too, Shawna! I can’t believe how many people have never even heard of this combination! But now I’ve done my part to spread the word . . .
I’ve never “dipped” Stephanie, but next time I will! Thank you for your comment. Kansas definitely has a lot of chili and cinnamon roll devotees! Never heard of this! In my house, adults-no, kids-YEEESSS!! I know this is against ALL rules but do you have a GOOD simple cornbread recipe? 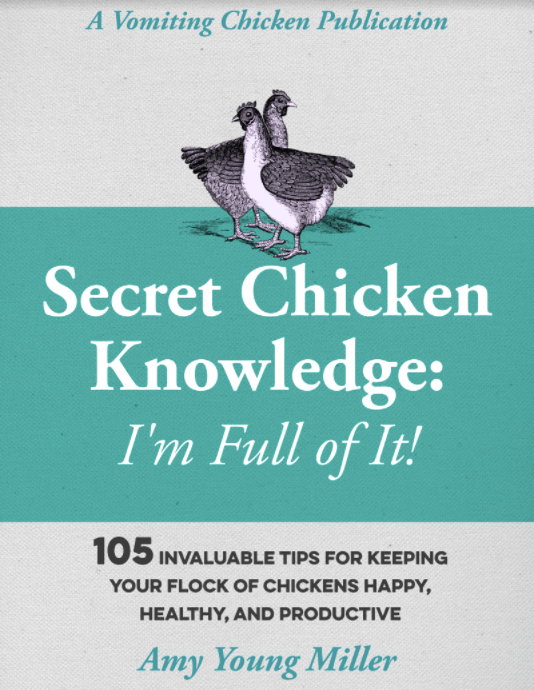 Is there one in your NEW book? I will have to get one!!! I DO have a fantastic and easy cornbread recipe, Rose. I will dig it up and try to post it this week, just for you! I love cornbread–especially melting with butter and dripping with honey! Awwaah…gee thanks! I would love you forever. It may force me into buying your book! I’m from Missouri and went to school in Lincoln, Nebraska, for four years, and I don’t remember ever eating or hearing of eating cinnamon rolls with chili. It has always been saltines or, better yet, cornbread. I just now looked online at Missouri school lunch menus and found some serving chili and cinnamon rolls in the same meal. Hmm, interesting, Pam. Were there Runza restaurants in Lincoln when you were here? They are pretty proud of their pairing of cinnamon rolls and chili. If there were Runza restaurants, I wasn’t aware of it. The college deli served runzas–yum! I didn’t have a car and rarely strayed more than a block from campus on foot–a very sheltered life! We all knew about Valentino’s Pizza, of course. It was catered in to the school at least once a year. I am from Morgantown, WV. We used to have cinnamon buns with Chili for school lunch when we were in elementary school. My mom would make either peanut butter sandwiches, corn bread, and cinnamon rolls. All 3 go very well with a bowl of Chili. I do one of two of the three every time I make it now. My Bad, when I said canned chili, I meant chili that my wife canned last year as in “home canning” LOL. As an after thought I was thinking that you might take it as Canned Chili, and was going to say it as chili my wife canned last year. It was actually made with orange tomatoes, wasn’t sure if I could eat it or not because I can’t eat red tomatoes. I’m not a texter either, but I do pay attention to my wife’s texting and the grand-kids’ “lingo”. LOL I don’t even know how to use a smart phone, why do they call them smart phones anyway? Since you asked how I was doing, let’s keep it simple and just say ok, will not bore you and any other readers with my health issues, not the right place or time. I will however let you know that I have 12 different peppers sprouted and growing, including the reapers. Will be starting early season crops soon, as soon as my daughter and I get finished building our greenhouse to put the peppers into (running out of room), which is a good thing. I hope you and everyone who comes here have a great and blessed day. Thanks Pete! I’m starting pepper and tomato (and collards and kale and cabbage and onions and so forth) seeds inside TODAY (hooray!). I’m a little behind because of a lingering illness, (gak) but am excited that I feel good enough to do this much! I’ve been cleaning out my chicken coop–in installments–into my hoop house, and once that chore is finished, my dad will bring his little tractor and ’til it in, and I’ll be ready to plant. Huzzah! It has been cold here in Nebraska, but Spring is coming . . . blessings to you and yours, as well. Sorry to hear about you not feeling well, will keep you in my prayers. I’ve got that itch too about getting garden ready, been trying to get everything in order and just found out that my wife’s cousin has a tractor to till with. I wasn’t looking forward to try and till it by hand but would of if I had too. Just purchased a Snapper front tine tiller for $100.00 that retails for $500.00 but is missing depth guage, still trying to acquire that. I hope you start feeling better! Thanks Pete. My grandma would have told me to go outside, expose as much skin as possible, and lie in the sun to soak up vitamin D. And then, eat dandelions. And then take a nap. I think I’ll go take my grandma’s advice! I am from Iowa, I believe this is a midwest thing not only Nebraska….however I make corn bread with my chili. Here in WV grew up with peanut butter sandwiches with chili but now eat grilled cheese with chili. I am going to try cinnamon rolls though. Peanut butter with chili? Why not? Sounds delish! I grew up eating chili soup, but don’t remember eating it with cinnamon rolls. It wasn’t until I married into my husband’s lovely family that we ate chili soup AND cinnamon rolls. But, oh my goodness, I never want to go back. It’s about time I make this combo again. Been in Nebraska my whole life! I’m from Idaho, I have never heard about eating cinnamon rolls with chili either. We are having a chili cookoff at work and someone suggested to serve cinnamon rolls with the chili and we all looked at each other like that person was crazy. After some discussions, it was advised by one person (from North Idaho – its a whole different type of person up there from us normal people here in the southern part of the state) that in North Idaho they eat it that way all the time. It sounds like those Northerners know how to eat their chili, Jeremy! 😉 Try it–you’ll be a convert, too! I’m from Iowa, and I’ve been eating Cinnamon Rolls with Chilli my whole life. Made this tonight and I’m from Iowa. Have had this combo my entire adult life. I believe a traditional meal I know even my grandmother served. First time I ate this was at school in Oregon. I grew up eating it this way as did my sisters. I moved to Kansas when I was in my 30’s and mentioned it to my husband and he thought I was nuts till he tried it. He grew up eating peanut butter sandwiches with his chili in Florida. His ex wife is from Nebraska who has never eaten it my way either. Cindy, thanks so much for chiming in. Oregon! What do you know? I’m from Colorado, lived here all my life. We’ve always had cinnamon rolls and chili, both in school and at home. I have friends that have moved away to Florida and other places where people think the combo is crazy. Took an informal poll of some friends this week and only a few were familiar with the idea, even some of the Colorado natives, so I’m not sure where the idea comes from. Maybe it’s from the German Russians that settled Colorado, Nebraska, Kansas, etc.. Would explain the Runza connection. Thanks so much for your input, Bob. I like the idea that it comes from the German Russians. There are a lot of them settled around our place. There’s even a “Germans from Russia” museum in nearby Lincoln. In grade school, cinnamon rolls were served with chili. Needless to say, this combo has a special place in my heart as a childhood memory. I am from Colorado. I actually came across this blog post because I was wonder if it was normal for me to make cinnamon rolls with chili for my boyfriend. He’s from New York and might then I’m crazy after this combo or perhaps he will think I’m a genius. I guess we will see! Great post. So glad to know I’m not crazy for knowing about this combo. Oh, no, Autumn, you’re far from crazy. Check out all the other comments on this post! You’re in good company. I absolutely LOVE the combination of cinnamon rolls and chili, and it looks like lots of other folks do, too. I’m from Colorado Springs, Colorado ( School District #2) and grew up eating Chili and cinnamon rolls together. Our schools served it all winter…and I have been making cinnamon rolls with chili my whole adult life…I’m almost 40. My hubby is from NY and thought it was strange but tried it and is a fan! So needless to say My family ALWAYS makes cinnamon rolls with chili….we now live in Arizona and my friends think I’m weird and it’s crazy. But the savory and sweet is oh so good! Some have tried it and agree it’s good…but some others won’t even try it. Cindy. Of course you are correct!! Just thinking about that combination makes me hungry. PLUS I think that you are perfectly justified in making the cinnamon rolls just a tad sweeter (I like to add a bit more brown sugar) and the chili just a bit spicier (jalapeno pepper slices!) to make it even more of a taste contrast. YUMMM! I’m from Minnesota and I’ve never heard of this. Sounds good though, maybe I’ll try it soon. I live in Missouri but I grew up in eastern Iowa, and I have never heard nor eaten cinnamon rolls with chili, I usually make a loaf of fresh bread to go with. I had never heard of cinnamon rolls with chili until I moved to Nebraska. I worked briefly at a nursing home in a rural Nebraska town. The population was primarily Mennonite. Chili and cinnamon rolls was the standard Friday night fare. They actually put the cinnamon roll in the bowl and pour the chili on top. I was mortified the first time I witnessed this. Although I don’t eat my chili on top of my cinnamon rolls, I now can’t imagine one without the other and neither can my family. I think Nebraska is where it all started. Thank you for the article. I am descended from Nebraskans and Mennonites (German immigrants to Minnesota from Russia). I grew up in Denver and never encountered chili with cinnamon rolls. The chili was either red with beans and beef or green with pork. My grandmother was from Kansas and certainly didn’t do it. I have a Mennonite cookbook that talks about making cinnamon rolls with zwieback dough, but there’s no chili recipe (they generally seemed adverse to spice). When I moved to Nebraska I finally encountered the chili cinnamon roll and was told you eat them together, not separately. They assured me it’s a Nebraska tradition. I was amazed at how good it was. They also put a bit of apple cider vinegar on their chili as a condiment. I’d love to know the history of red chili. Red chili came from northern Mexico and its called Chile Colorado. Its served with corn tortillas or zwieback rolls if you are a member of the Alt Kolonier (Old Colony) Mennonites from Mexico that live in Southwest Kansas to Seminole, TX. I grew up in northeast Colorado and eat chili with cinnamon rolls plus i eat Chile Colorado with corn tortillas or zwieback rolls when i am working at the beef plant inspecting. I always make cinnamon rolls with my chili. I grew up in Wyoming and chili and cinnamon roll day at school was the most popular day for parents to come eat with their kids. Every other state I have lived in people thought this was a crazy combination. Well, Lynn, we in Nebraska wouldn’t think you were crazy at all! Grew up in Nebraska and chili with cinnamon rolls is a tradition. I love it! I grew up in Kansas and went to school there in the 70s and 80s. I went to school in a small town in east-central Kansas and high school in Topeka. The schools I went to always served chili and cinnamon rolls. To this day, I still associate the two together. Thanks for weighing in, Nan! And nice ta meetcha, neighbor! Does this chili recipe taste like Runza’s Chili? Um, I’d say it’s close, but it’s not a copy by any means. I actually didn’t realize anyone else did this lol. I thought it was just me. Fyi I’m in Pittsburgh Pennsylvania. I’m late to the conversation, but someone sent this to me and I thought I’d add my two cents. I’m an Iowan (however, I was born in California and lived in Pennsylvania and Oklahoma). I had never heard of Chili with Cinnamon rolls until I moved to Iowa. when I was 13. No matter how someone made their chili (one friends dad put mushrooms in his version) there were ALWAYS cinnamon rolls. I immediately fell in love with the two together. My youngest son enlisted in the Army last year and is stationed at Ft. Polk in Louisiana. The first time he called us after making his first batch of chili and cinnamon rolls he told us that he had shared his chili with the guys on his barracks floor. There was only ONE guy, another Iowan, who had ever heard of the two together. He said a couple of the guys who are from the south told him it was the “grossest combination” and a complete “insult” to chili. He said that he told them, “You all eat ‘mud dogs’ (crawfish), yet chili and cinnamon are ‘gross’ and an ‘insult’ to chili?” After trying it, there were a couple that actually found that they liked it. I’m not sure where the paring originated, all I know is that I have lived in Iowa for 32 yrs. I have eaten chili and cinnamon rolls together since I moved here and you could ask anyone, young or old, and they will tell you that they have always had the chili/cinnamon roll combination. I should also mention that with the exception of the other Iowan, none of them had ever heard of walking taco’s either. Anita, thank you so much for weighing in. I’ve heard from other Iowa readers who eat this combo all the time! And I ask you . . . how can cinnamon rolls and chili together ever be described as “gross”? I don’t see that!? I wonder if this combo started at church suppers, actually, because I’ve had a lot of church suppers with cinnamon rolls and chili soup! I grew up in a small rural town in Kansas and our School always had Chili and the best Cinnamon Rolls. As a grown up I have found that many other people who grew up on small towns also had this as a school staple. I believe most of us still eat Chili and Cinnamon Rolls. We just had it this week for dinner, Cyndia! Live in Colorado my entire life and YES! Grew up on homemade chili and homemade cinnamon rolls….even the schools in Northern CO had “chili” night and the rolls were served right along with the chili. Oh my gosh. I just Google chili and cinnamon rolls and I saw this. Everyone thinks im a weirdo here in Kansas City. But that was my favorite elementary and middle school lunch. I just thought it was normal. I grew up in Topeka KS. I wonder if it is a bit regional. I grew up in Southern Colorado and never had heard of it until I moved to Western Nebraska. I thought they were crazy to be honest until I tried it the first time. My favorite way to eat them is float them right in the middle of the chili, my little ones love that too. The schools here all have it for lunches, as does Runza, but the Wyoming schools don’t seem to do it, and they aren’t that far away. Yum, I’m really hankering for chili and cinnamon rolls now. I am from Florida. Grew up in Kansas. I’ve never heard of such a thing as chili and cinnamon rolls! Until one day I was at work (in a nursing home) and they served chili and cinnamon rolls. I thought it to be odd but all the residents loved it. Said thats how they used to eat their chili all the time. I had no clue. I always make cinnamon rolls or strawberry rolls. But now when i make chili i also make rolls! Super Good!! Brittany, welcome to the club! If I fix chili and don’t have time to make cinnamon rolls with it, my family has very long faces, indeed. I am a Swiss Volhynian Mennonite from Kansas. Grew up always having chili and cinnamon rolls in school, and my mother always made cinnamon rolls with our chili, but I thought she just got the idea from my brother and I liking the combination from school lunches. This is the first I’ve heard of the combination possibly being attributed to Mennonites. I’m skeptical. I think the Swedes invented cinnamon rolls. If I were to guess, I would think that the combination originates from a Swedish settlement in Nebraska. I would attribute the spread of the combination to public school systems who likely take menu ideas from each other. In any case, I can’t ever separate the two from each other in my mind. They go hand in hand. Thanks for your thoughtful contribution to the topic, Ryan! We are in topeka ks. Both my wife’s and my family have farming backgrounds. Growing up I had hamburger soup my mom called chili with vegies,carrots, celery, bread and margarine. My mother in law made good chili starting with a chili stick, and always had dill pickle spears, cheddar chesee and soda crackers. I never heard of cinnamon rolls with chili until having it at monthly luncheons at work.We’re having chili for Christmas eve, and our son in law said oh, yum, cinnamon rolls and chili. So guess what,we’re having cinnamon rolls and chili for the first-time. Change is good. Well said, Robert! Yum, sounds delicious!! I am a Nebraskan, proud of my roots, who’s lived in Europe for the better part of 25 years. Was just talking this morning to two friends about the chili-and-cinnamon-roll phenomenon. They were, of course, incredulous. So I came home and googled it and ended up here with your article, the link to which I’ve sent them. The result of this is that my friends and their wives are likely to soon become acquainted with – you guessed it – chili and cinnamon rolls. So kudos to you from my part of the world. Knnuki, your comment just made my day. Thanks for spreading the word about this fabulous combo! Can you tell me where you live in Europe, and where you grew up in NEbraska? My hometown is West Point in Northeast NE. I’ve been back there many times over the years for class reunions and to visit old friends; it’s a wonderful, small-and-thriving town; I know many towns like are dying but WP seems to go from strength to strength. My family and I have lived in the West of Scotland (Glasgow) and are now in Dun Laoghaire on the south side of Dublin in Ireland. The Chili and Cinnamon roll dinner plans are…well, rolling : ) I’ll let you how the locals respond. Oh please, do keep in touch Knnuki. I’d love to see PICTURES too, please! All right dramamama, here’s an update since we started this conversation about 20 months ago. Finally – finally! – I have organized a chili and cinnamon roll night at my place this coming Saturday. One friend, a guy, is a bit of a chili guru and I’m making the cinnamon rolls. Another local friend makes a mean trifle so it will be a ChilliCinnamonRollTrifle evening (most things from Nebraska require cultural adjustment to succeed on this side of the world). Why has it taken so long to organize this? Because our wives are appalled at the menu combination. We’ve all had to solemnly promise that no one will be forced to consume anything, or any combination, they find distasteful (we’re a peace-loving tribe: we would never force anything). I will let you know how it goes and yes, there will be pictures! And…I believe you know a long-time family friend, Marcia Claesson, yes? And one more thing. Vomiting chicken? Seriously?? Please do enlighten us. I am from Wichita, KS and I grew up on Chili with Cinnamon rolls. As the son of Texas born parents this combination was not unfamiliar. I do have fond memories (as fond as possible) of school lunches with Chili & cinnamon rolls in grade school too. To each their own! Thank you, Chris, for chiming in! I laughed at “as fond as possible.” Ha! I’m not sure what jogged the memory, but now I know that it really was a thing – chili and cinnamon rolls. Growing up in Nebraska, we were more of a chili and saltine family, but I remember the combination from school lunches and other families. Moving to Oklahoma, where I live, I discovered “Frito chili pie” (chili served over a bed of Fritos corn chips). That’s very popular here and the only way my wife eats chili. Maybe a successor of chili and cornbread? I think my wife might be game for chili with cinnamon rolls, but I’m not sure I want to go there, given that I can’t just pick them up at Miller and Paine’s. I had a good friend who was especially proud of her Cincinnati style chili, where the cinnamon is added to the chili itself.I wonder if the two approaches are related? Now that is a good question, Steve! Occasionally I do make chili and add cinnamon to it. I am from Iowa and we ALWAYS had chili with cinnamon rolls. At home, church, school, etc. I moved to Southwest MN and they had never heard of it. I was shocked. Now I live in Northern MN and you’d think people saw a ghost when I tell them it’s the only way to eat chili. I’m from Minnesota, and we eat chili with cornbread at my house. BUT, my mom is from Nebraska and she ate it with cinnamon buns as a kid, so she always tries to convince us to try it. Not gonna happen! Awww, Jocelyn, you really should try it . . . do it for your mama! I grew up in Central Illinois. I don’t think we ever had cinnamon rolls for a school lunch, with or without chili. At home we had either corn bread or crackers (usually oyster crackers) with chili. My husband, from western New York, remembers only crackers. Thanks for chiming in, Jenny! NOW you need to try it! You may just love it! 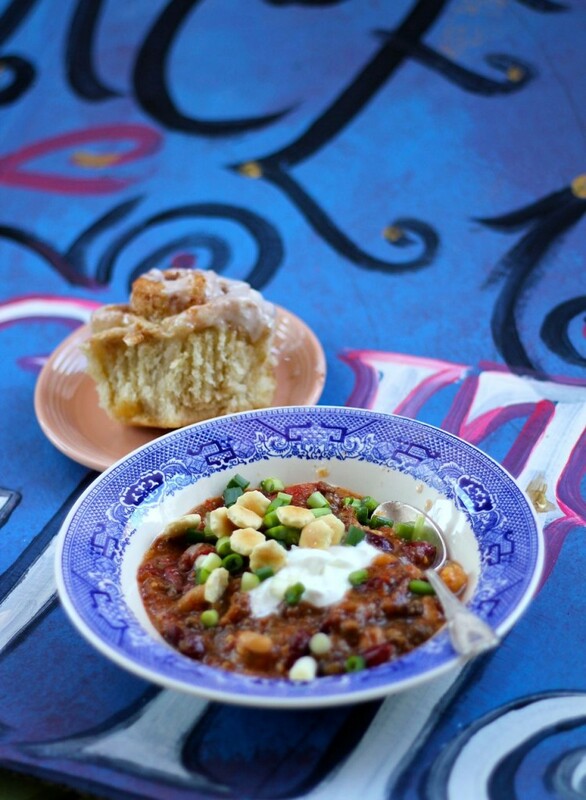 Chili and Cinnamon rolls have been served in most schools in the Great Plains region of the US for a hundred years. From Saskatchewan to Houston. The combination was most popular in the 40’s – 70’s. Thank you, Leona! And happily so, I might add! Anita, the Mennonites around here that I know do eat cinnamon rolls with their chili! I’m from north central Texas, in fact our area is called “Texhoma.” I have never in my life heard of this combination. The thought of it doesn’t sit well with me. We eat cornbread or perhaps Frito or tortilla chips with our chili. Hmm Jenn, I think you really ought to try it! You never know, you might just like it! Thank you for your comment! I live in Tampa, FL, and havent had cinnamon rolls with chili since elementry school lunches in Kansas City, KS. Had forgotten about it until now, 30 yrs later. In retrospect, those were the BEST lunches. My mom never made them together, and neither did I when I started making my own chili. Next time I do, I am going to surprise my husband with cinnamon rolls. (Are the ones from Aldi acceptable, or should they be home made?) He grew up in Illinois, so I will study his reaction. Something he remembers, or new concept? Yay or nay? I agree, Molly, in our public school the hands-down favorite lunches were the cinnamon and chili ones. YUM. If it’s wrong to eat dessert with your chili, I don’t wanna be right. Right??? I AM A HUSKER AND ATE THIS FOR SCHOOL LUNCH. I AM NOW IN TEXAS( I HATE IT TOO) AND I AM BLOWING MINDS WHEN I EAT THIS COMBO FROM THE CAFE AT WORK. I WILL LEAVE MY MARK ON TEXAS WITH FOOD!! !